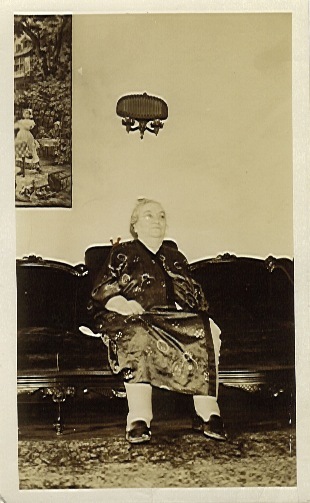 I always found my great-great-grandmother Tama Leah intriguing, mostly because of her name. When my grandfather first told me about her, neither of us knew how her name was actually spelled and I wrote it down as Tomalea. It reminded me of tomatoes and I thought it was funny. Later, I found out that it isn’t as unusual or strange a name as it seems and how it’s actually two names — like Mary Ann — but still. There is something about Tama Leah that reminds me of tomatoes. As my grandfather told me once, Tama Leah was a rather “ungainly” woman – at least during the time he knew her. She was married to the always dapper Frank, but obviously they had very different metabolisms, in addition to the fact that Tama Leah bore 6 children that lived into adulthood. When she was about 70, Tama Leah fell and broke her hip. As happens now with older people who fall and break things, she had to spend a long time in bed, being cared for by a nurse and waiting for her bones to hopefully knit back together. But, lying there in bed, she caught pneumonia, which eventually killed her. My grandfather was at camp when she died in July 1933. “I was only a kid,” he says and they called him at camp to tell him about it. There is another part of the story about Tama Leah’s illness, one which involves the nurse caring for her and her oldest son, Herman. Herman was the most successful businessman in the family and worked as an executive for the A. Hollander & Sons fur manufacturing firm. I am secretly convinced that the Hollanders were cousins of some kind, but regardless – Herman employed a wide range of relations (brothers, brothers-in-law, cousins) at A. Hollander and supported other family with his own generous earnings. Herman was married to Ernestine – Aunt Ernie, that is – and they had two daughters. But then Herman met Tama Leah’s nurse and they had an affair and he & Aunt Ernie got divorced and it all sounds very traumatic. Needless to say, this was probably not an outcome that Tama Leah would have wanted to have anything to do with. Thankfully, there is redemption in this story: Herman & Ernie reconciled and remarried in Maine in 1939. Tama Leah’s first grandson was born to my grandfather’s favorite cousin Blanche, after Tama Leah had died. The baby was named after her: the slightly more melodious Thomas Lee.